There are many different varieties of Miscanthus grass. The ones of most interest to the cooler climate tropical gardener are the giant Miscanthus or fountain grasses. Originally Miscanthus sacchariflorus and Miscanthus floridulus were the principle giant varieties. Miscanthus giganteus, a cross between M. sacchariflorus and M. sinensis, seems to have grabbed the limelight of late due to biofuel charade. 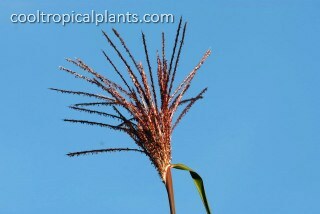 The Miscanthus grass discussed on this page is M. floridulus. 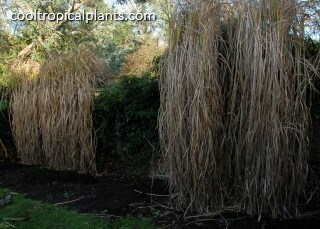 Treatment for the other giant Miscanthus is the same. Acquiring your giant miscanthus grass requires an element of forward planning. These plants generally don't make it onto the shelves during the spring bedding plant rush, appearing as they do later on in the season. If you are planning to incorporate tall grasses in an upcoming season you need to remember to leave a space for it. Alternatively you can buy your plants later. Keep them in pots until the frost come. Once you have tidied up after the first frost plant them out ready for the following year. 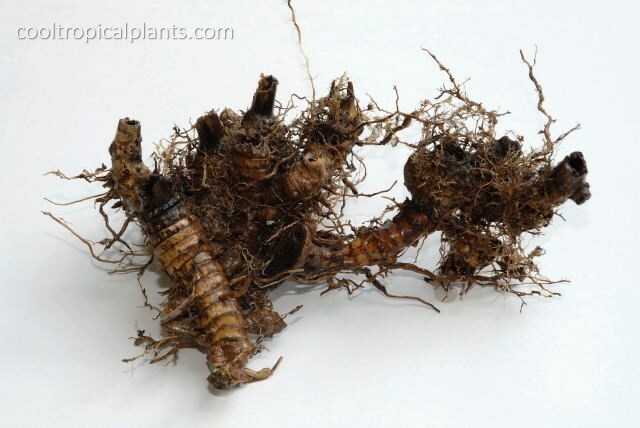 Some suppliers sell bare clumps of rhizome during the winter. This is probably the best route to take as the rhizomes can be planted during the winter/spring. They roots will be able to establish more efficiently than a plant purchased halfway through the season. Tall growing grasses are also troublesome to fit into a car, bus or any other form of public transportation. Avoid the temptation to purchase cheap mail-order plants. These are invariably no more than a single shoot or so and you may well have moved house before they have had the chance to look impressive. 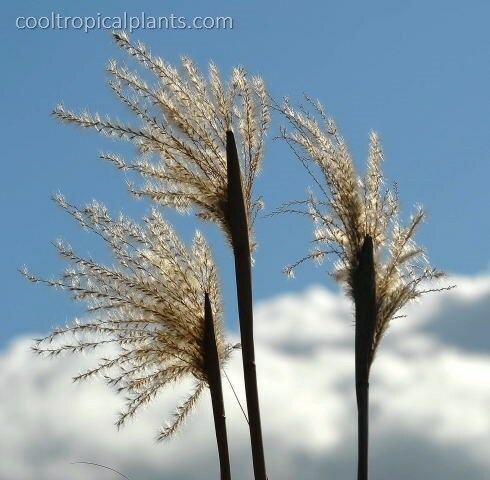 These tall grasses are relatively easy to look after. They require no supplemental watering once established. (Particulary dry summers will cause the lower leaves to begin yellowing slightly earlier than usual). Their Achilles heel is the wind, but once the stems have reached final height and have hardened up this is less of a problem. 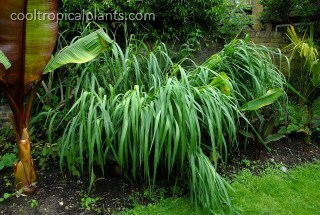 They would not be ideal plants for the first line of defence against wind in a coastal garden. Although these grasses have a height of around 3m (9 foot 10 7/64 inches), their height is restricted (aesthetically speaking) to the summer months. The taller Miscanthus grass should not be relied upon to screen ugly objects during the winter as you will need to toss a coin as to which one is uglier. For temporary screening of an area only used during the summer months, such as an over-looked patio, they are ideal. Planted to the rear of a border or in corners are the best location for your plants. Island beds are less suitable, as they provided little shelter from the wind and make re-staking difficult after a windy spell. Miscanthus floridulus (in this garden) begins to stir towards the end of March. By the end of June/early July it will have reached more or less full height. Over the past few years "Unseasonably high winds" have regularly passed through the garden in early June. 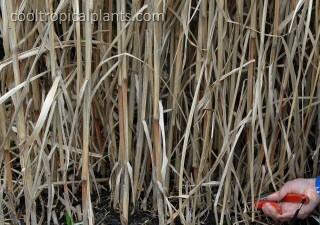 The emerging Miscanthus grass stems are particularly flexible at this stage of their development. They can be repositioned fairly easily but it is advisable to wear long sleeves for such a job. The tiny serrations along the edge of the leaves are quite irritating to skin. 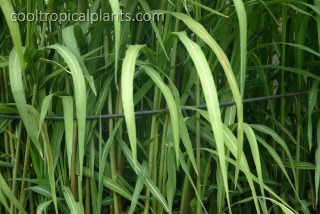 Tall link-stakes can be used to support the sagging stems. String also works OK but has the tendency to abrade against the stems during breezy conditions. A particularly good product for the job is the rubber tubing used for sealing between gaps in floor boards. It is flexible and does not rot immediately. Whether or not your giant miscanthus will flower would appear to be somewhat weather dependent. 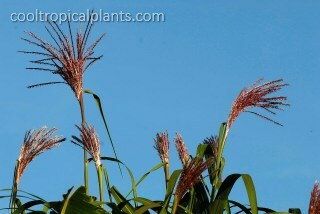 When the conditions are suitable the Miscanthus floridulus featured on this page flowers around mid October. There has never been any incident of self seeding as a result of the flowers. The presence of flowers on the dried stems does improve their appearance during winter. It does not however prevent all the dried sheaths of the stems from being blown about all over the garden. 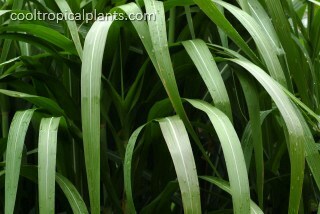 Regardless of whether or not your grasses have flowered, it is a good idea to cut back the stems in the autumn. Hand held secateurs are the tool for the job. Once again wear suitable clothing and sturdy footwear. The stem stumps are quite rigid. If there are flowers, remove them from the stems before shredding. Secure the flowers on a branch of a tree or somewhere else that is accessible for birds. Birds are quite fond of the fluff to line their nests in spring. 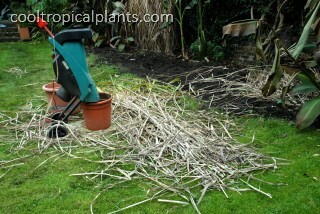 The shredded stems of the miscanthus grass make an excellent addition to the compost heap. It is particulary effective if the shreddings are mixed up with all the frost damaged tropical stuff. The tropical foliage is very wet. If the compost heap is filled with just tropical foliage, it takes a considerable time to break down. Mixing in shredded stems speeds up the process considerably. Miscanthus are relatively well behaved relative to bamboo when it comes to taking over the garden. It is unnecessary to restrict their growth with root barriers. The plants will nevertheless spread. Eventually they will begin to outgrow their alloted space. The rhizomes of Miscanthus are quite tough and woody. It is not simply the case of slicing sections off with a spade. Using an old wood saw, cut through the rhizomes. Using a mattock and spade dig under the section you have cut. Try to make the sections as large as possible so that the clumps can be used elsewhere or given away. It is a reasonably tough job particulary if the grass is situated in an awkward location.